Located on the unceded Coast Salish Territories of the xʷməθkʷəy̓əm (Musqueam), Sḵwxwú7mesh (Squamish) and səl̓ílwətaʔɬ (Tsleil-Waututh) peoples. bi-monthly at the Wise Hall. 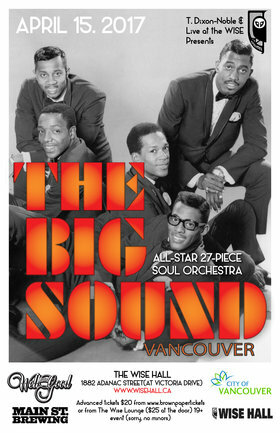 Hi-Records & of course, Motown with a sound that will blow your mind. The Big Sound: Vancouver is committed to never playing the same set twice so expect to hear a new set of classics every time. If you were with us for Februarys show, you know the deal. If you missed out last time, don’t sleep. Grab your tickets in advance and get ready to dance.